INCIDENT AT VICHY by Arthur Miller at Signature Theatre, Oceober 27, 2015-December 6, 2015 | The Drama Book Shop, Inc.
"ONE OF THE MOST IMPORTANT PLAYS OF OUR TIME"
Celebrating the Centennial of Arthur Miller’s birth, Incident at Vichy returns the work of the Pulitzer Prize winning playwright to Signature for the first time since his 1997-98 Residency. In Vichy, France at the height of World War II, nine men and a boy are rounded up under suspicious circumstances. As ominous reports of far-off camps and cattle cars packed with prisoners begin to circulate, the men battle over politics, philosophy and how to escape. Longtime Signature director Michael Wilson (Horton Foote’s The Old Friends and The Orphans’ Home Cycle) helms this haunting examination of the cold, bureaucratic efficiency of evil—and the shared humanity that might overcome it. 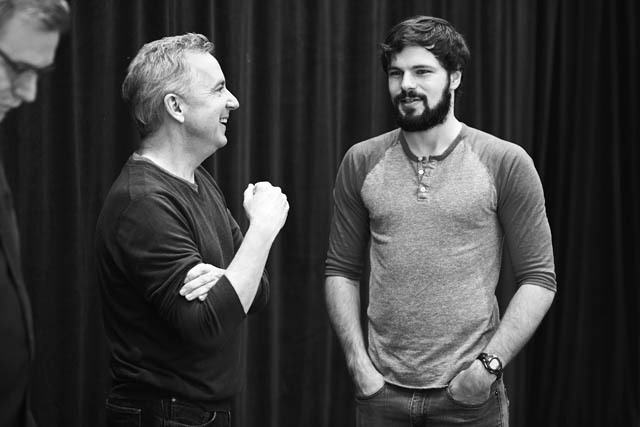 Founding Artistic Director Jim Houghton and actor Jonny Orsini. Photo by Gregory Costanzo.